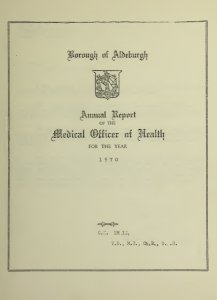 The letter reproduced below and accompnying report for the year 1970 was sent to the Borough of Aldeburgh by its outgoing Medical Officer of Health, C H Imrie. I have pleasure in submitting my Annual Report for the year 1970 prepared on similar lines to those of previous years. With regard to the general health of the community, 1970 was largely free from sickness. Even measles which could always be relied upon to appear from time to time, was absent during the year. The main problem in the environmental field is the sewage works. This project has been dogged by misfortune from the beginning and it is only to be hoped that in the near future remedial measures will be successful. This is the last report I shall write as Medical Officer of Health of Aldeburgh and I would like to take this opportunity to thank the Council and Officials for their kindness and assistance over the years. When I first came to Aldeburgh I thought it grey and uninviting, but soon I grew to appreciate its special and individual atmosphere and I will always remember it with interest and affection. Annual Report 1970. Click on image to open pdf.